The traditional Australian lamington dessert typically consists of white cake, chocolate frosting, and dried coconut. 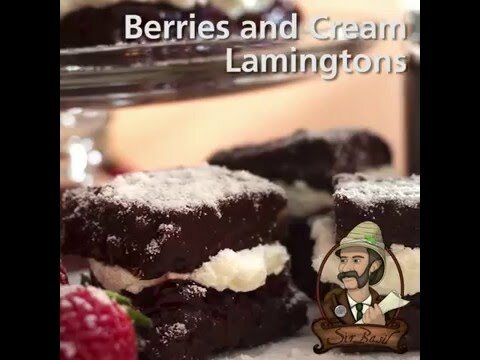 These lamingtons include strawberry preserves, a delicious creamy white chocolate filling, and sub TSTE® Coconut Flake Powder (for dried coconut) for a much smoother version with extra flavor packed in. SIFT together flour, baking powder, and salt. Set aside. Beat softened butter and white sugar with an electric mixer until fully mixed and lighter in consistency. Beat in eggs one at a time, then mix in 1 tsp TSTE® Madagascar Pure Vanilla Extract. Add flour mixture and milk alternately, stirring after each addition just until incorporated. COAT a 9x13 pan with non-stick spray and spread batter inside. Bake for 30-40 mins or until a toothpick inserted in the middle comes out clean. Allow to cool (covered) overnight. Remove cake from the pan and slice horizontally to create two layers. Cut each layer into 24 pieces. MAKE the icing. In a large bowl, beat together powdered sugar, TSTE® Cocoa - Dutched, warm milk, and melted butter. Dip and cover each piece of cake in chocolate icing. Allow to cool on a wire rack or parchment paper. WHILE cake is cooling, make the cream filling. Add heavy whipping cream and chopped chocolate into a small saucepan and heat over low, stirring until chocolate is completely melted. Refrigerate until cold (it is also helpful to refrigerate the beaters and bowl you will be using to whip the cream). Beat the mixture until a thick cream is made and stiff peaks form. ASSEMBLE lamingtons with: a cake square, a layer of preserves, a layer of whipped cream, another cake square, and covered in TSTE® Coconut Flake Powder. *To make this recipe quicker, an already made cake can be substituted as long as it is a firm type of cake (such as butter cake, pound cake, or sponge cake).